Demand for bricks, blocks and pavers in the US is forecast to rise 8.8 percent per annum from a low 2013 base to $8.9 billion in 2018. Bricks, typically made of clay, will see the most rapid growth of any product, driven by a rebound in new housing construction. Pavers will be the second fastest growing type, driven in part by interest in “green” building materials such as permeable pavers. 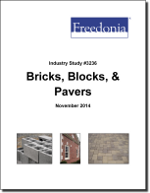 This study analyzes the $5.8 billion US brick, block and paver industry. It presents historical demand data (2003, 2008, 2013) and forecasts (2018, 2023) by product (structural concrete block, brick, pavers, wall block), material, market (e.g., residential building, nonresidential building, nonbuilding), application (e.g., structural, hardscaping, siding, fireplace) and US region. The study also considers market environment factors, details industry structure, evaluates company market share and profiles 34 industry players, including CRH, Quikrete and Berksire Hathaway.